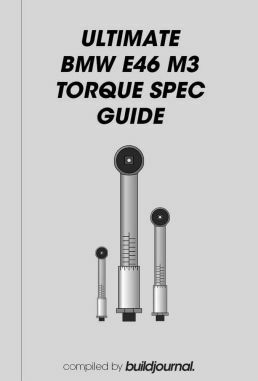 Use this guide as a cheat sheet for all the torque values for your E46 M3. If you’re like me, I even forget what the basic oil drain plug and filter housing torque specs are. From door panel specs to engine head torque values we have it all listed for you. Don’t over tighten another bolt ever again! If you want a physical copy for the garage we formatted a printable copy available for download below. Our chart torque specs were compiled from BMW E46 3 Series (1999-2005) Service Manual by Bentley Publications. We made a printer-friendly version for your garage. No more dirty phones. BMW 3 Series (E46): Service Manual: M3, 323i, 323Ci, 325i, 325Ci, 325xi, 328i, 328Ci, 330i, 330Ci, 330xi: Sedan, Coupe, Convertible, and Sport Wagon: 1999, 2000, 2001, 2002, 2003, 2004, 2005. (2005). Cambridge, MA: Bentley.